The History Department is pleased to announce that the M.A. 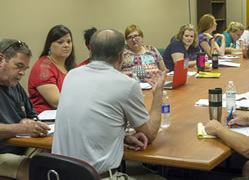 program for professional history educators (ONLINE) is now accepting applications for admission in the Fall 2019 semester. Applications will be reviewed as they are received. There are a limited number of spaces, and we expect the program to fill up quickly, so those interested in applying are encouraged to do so soon! In the event that spaces remain in the program new applications will be entertained until July 1, 2019. UNCW’s online Master of History program is enjoying well-deserved success, being ranked 1st nationally by the websites BestColleges.com and GradSource and 10th on a list compiled by the web-based College Affordability Guide. BestColleges.com bases its rankings on academic quality, affordability and quality of online programming. In addition to quality and affordability, GradSource rankings consider flexibility and prominence of the program. The College Affordability Guide considers “institutional fit,” including an emphasis on programs for nontraditional students; affordability; and successful completion of programs. to develop the professional practices of history educators to reflect deep understandings of content. In short, the program is designed to strengthen and sustain a love of history in a learning environment created for dedicated teachers. It MAY qualify its graduates for salary increases and strengthens participants' existing ability to bring history to life in the classroom with new and deeper knowledge. In 500 words, explain your interests in history. Avoid empty generalizations like “I’ve always loved history.” Instead, tell with greater specificity what historical themes or questions interest you most. Also, explain why you believe UNCW’s online M.A. program would benefit you intellectually and professionally. Two-Year Program: Students will take two sequential on-line courses each semester and participate in two on-campus Summer Institutes. The course of study is complete after four semesters and two Summer Institutes. On-line Courses: The central focus of the Fall and Spring Semester coursework is on examining major issues and recent historiography related to the Common Core history curriculum. The Fall and Spring Semester courses are entirely on-line and asynchronous. Faculty-moderated, professional discussions integrate course materials and assignments, and can be completed alongside students' personal and professional obligations. Two, one-week Summer Institutes: These in-person classes will convene in June during UNCW's second Summer Session. One week of instruction will be held on campus each summer; the remainder of the coursework can be completed on campus or via distance learning. Capstone Experience: The capstone experience for the program focuses on hands-on application of content to teaching situations and lesson planning rather than a traditional thesis. The capstone experience also includes the production of a historiographic essay and comprehensive exams derived directly from course content and will be held during the second Summer Institute. Access to experts: All courses are taught by regular, full-time UNCW faculty who have decades of experience in education, and have published extensively in their fields. Streamlined admissions process: Preferred applicants are North Carolina professional educators in both public and private educational institutions. The deadline for applications (for the next cohort of students, entering in Fall 2018) will be July 1, 2018. Completed applications will be reviewed beginning October 15, 2017. GRE scores may be waived in certain circumstances. For more information contact the History Department's Graduate Coordinator, Dr. W. Taylor Fain. Costs: On-line tuition prices for distance education apply to Fall and Spring Semester courses. The approximate tuition for the two-year program totals $6,800 for in-state students, not including books. Summer pricing reflects on-campus rates for tuition and fees and does not include housing for the on-campus period.